Team Arctic terrain racers struck gold again, winning the snocross at the ESPN Winter X Games in Aspen, Colo., and taking 17 class wins at the USXC cross-country in Oslo, Minn. The X Games snocross gold once again belonged to Team Arctic/Monster Energy pro Tucker Hibbert, the winningest snocross racer in history and the first X Games athlete to win seven back-to-back gold medals. Hibbert dominated the snocross event from start to finish, winning by 13 seconds over second place to claim his eighth career gold and 12th career medal at the prestigious event. 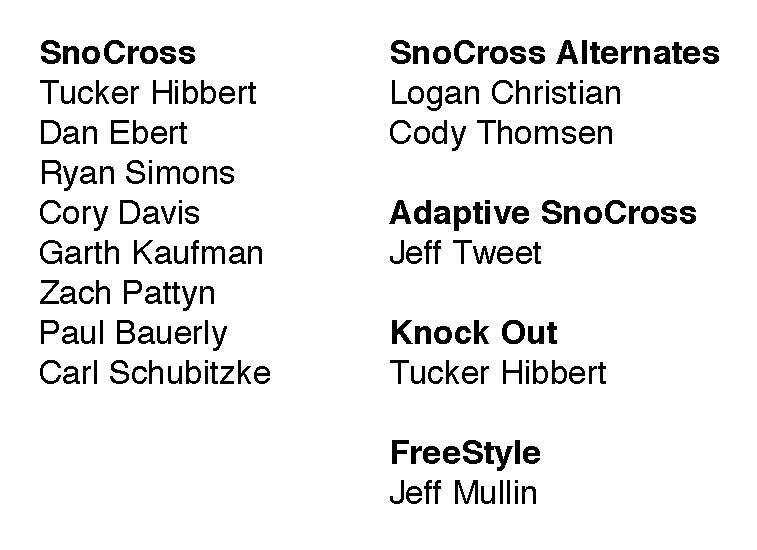 Team Arctic cross-country racers delivered their own gold medal-winning weekend, capturing the win in 17 of 21 finals at the first ditch event of the season in USXC. Zach Herfindahl led the victory march with a solid win in the Pro Stock class. After suffering a DNF while leading the Pro Open final – the result of a rock puncturing his sled’s heat exchanger – Herfindahl raced the stock class on the sled of his Christian Brothers Racing teammate Ryan Simons. Simons finished second in the Open class and would have been in contention to win the Stock class had he not graciously offered his sled to Herfindahl, who leads the point chase. Timmy Kallock waited for the ditch races to start his season, and it paid off with his sweep of the Semi Pro Stock and Improved classes. 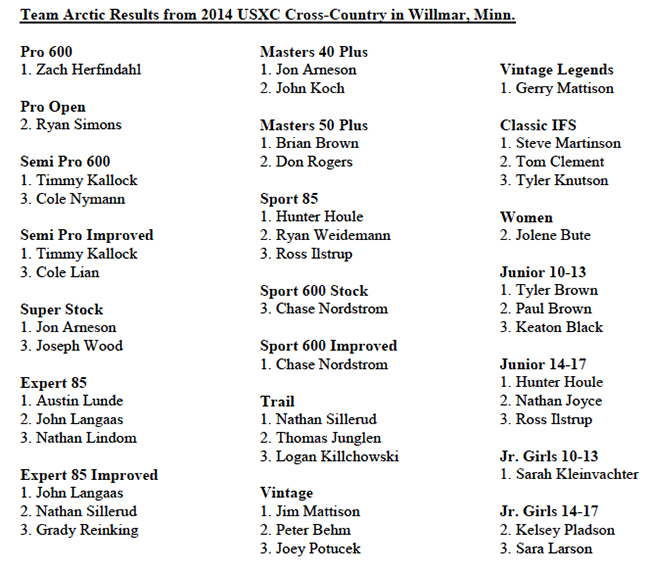 Other double winners included Jon Arneson (Super Stock and Masters 40 Plus) and Hunter Houle (Sport 85 and Junior 14-17). 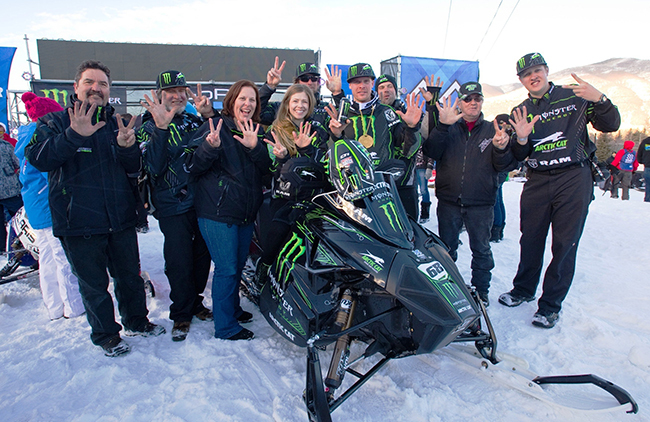 Team Arctic racers swept eight class podiums while garnering 43 of 63 possible podium places. Thief River Falls, Minn. (9/10/11) – The official start to winter kicked off today at the largest snowmobile event in the world – Haydays. 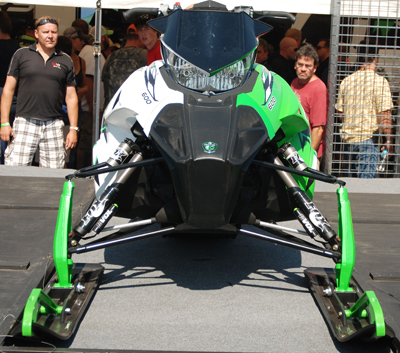 Thousands of loyal Team Arctic race fans were treated to the first unveiling of the all-new 2012 Arctic Cat Sno Pro 600 race sled. “Racing has been a strong cornerstone of Arctic Cat’s heritage and brand. An arena we have consistently used for testing and development. It’s our commitment to race the ProCross chassis and show the world that our consumers can buy the same snowmobile to conquer the world’s toughest terrain,” said Brad Darling, GM Snow Division. 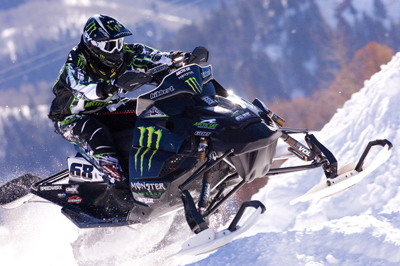 Defending his ISOC Pro Points Championship Title, Tucker Hibbert will race the full season aboard the all-new 2012 Sno Pro 600 as well as compete for his sixth-consecutive ESPN Winter X Games gold medal. If he wins, Hibbert will become the only athlete in the history of Winter X to six-peat. Hibbert has competed every year since 2000 and currently holds 10 medals, six of which are gold. 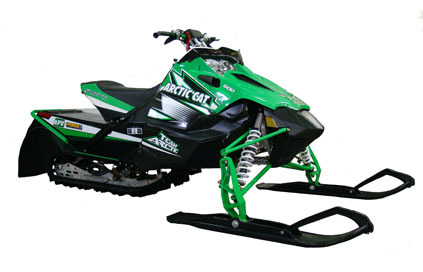 Arctic Cat Inc., based in Thief River Falls, Minn., designs, engineers, manufactures and markets all-terrain vehicles (ATVs) and snowmobiles under the Arctic Cat® brand name, as well as related parts, garments and accessories. Its common stock is traded on the Nasdaq National Market under the ticker symbol “ACAT.” More information regarding the all-new 2012 Sno Pro 600, and other Arctic Cat products please log on to www.arcticcat.com or visit your local dealer. For more information on Tucker Hibbert, please log on to www.tucker-hibbert.com. 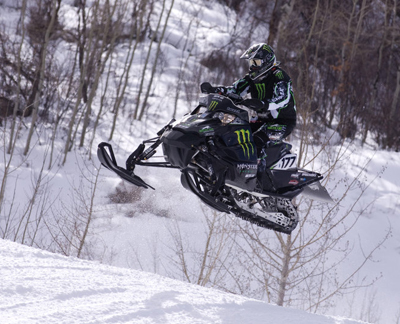 Team Arctic superstar Tucker Hibbert claimed his sixth Gold Medal at the ESPN Winter X Games in Aspen, Colo., with another dominant display of snocross supremacy. It was Hibbert’s fifth consecutive gold medal and his 10th medal in 12 years. His teammate and mechanic Jeff Tweet was equally impressive, finishing with a silver medal in the Adaptive Snocross final. Racing his Monster Energy Arctic Cat Sno Pro 600 with a Speedwerx modified motor and clutching package, Hibbert combined strong holeshots with his typical blazing speed and control to convincingly win his heat race and final. The only drama happened on the first lap of the final, when one competitor jumped the start and another partially landed on Hibbert before veering off the track. Hibbert shrugged off both incidents, took the lead threw down a series of fast laps before cruising to an unchallenged win. The victory moved Hibbert past Blair Morgan on the all-time win list. Factory Team Arctic Semi-Pro Kyle Pallin finish an impressive fourth place in the final, leading a team green charge that included Dan Ebert (fifth), Cody Thomsen (sixth) Zach Pattyn (seventh) and Johan Lidman in tenth. Jeff Tweet’s silver-medal in Adaptive Snocross was sweet retribution after breaking his leg in last year’s Adaptive race. Tweet double-jumped his way through the final technical section of the course to pass into second-place, and his first X Games medal. 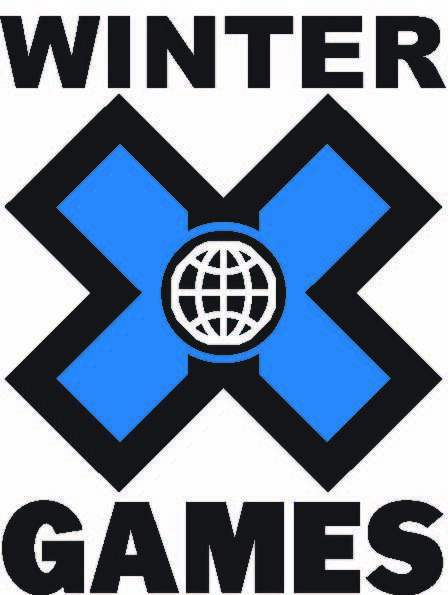 Winter X Games, the premier action sports event in the world, is going on all this weekend (January 28th – January 31st) in Aspen, Colorado. More than 200 of the best action sports athletes, including 51 past Olympians, will compete in skiing, snowboarding and most importantly, snowmobile racing. Amongst the competitors are several Arctic Cat sponsored riders including Snocross Pro, Tucker Hibbert, who will be looking at an unprecedented four-peat gold medal for 2010, as well as competing in a new event called Knock Out. Equally important, Jeff Tweet, Arctic Cat snowmobile Dyno Technician, will be representing Team Green in the Adaptive Snocross race. 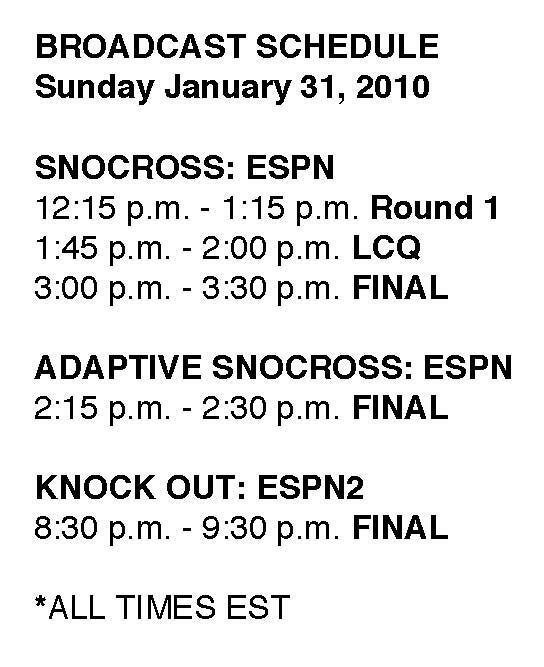 Make sure to catch all the racing action and cheer on our Team Arctic competitors!